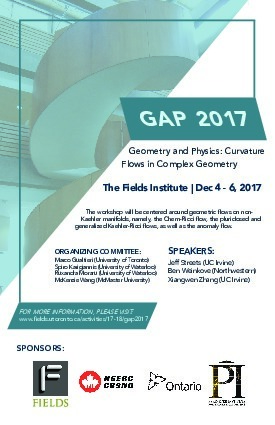 The workshop will be centered around geometric flows on non-Kahler complex manifolds. In differential geometry, geometric flows are given by evolution equations for special tensors on manifolds, where the evolution is in a direction that has a natural geometric interpretation. In some cases, geometric flows are gradient flows of natural geometric functionals on manifolds. Of special note is the Ricci flow. It was introduced by Hamilton (1981) and is a key ingredient in the proofs of the Poincaré and Geometrization conjectures as well as the Differentiable Sphere Theorem. If the Ricci flow starts from a Kahler metric on a complex manifold, it is called the Kahler-Ricci flow. In this case, the evolving metrics remain Kahler and the flow has been used to study moduli of Kahler metrics along with the existence of Kahler-Einstein metrics. Moreover, its behaviour is by now well-understood on compact Kahler surfaces. In general, geometric flows are natural tools for investigating the existence and classification of canonical metrics on manifolds, and for studying the underlying topology of the manifolds. These flows provide new methods for studying non-Kahler complex surfaces and threefolds that are of great interest to a wide range of mathematicians and physicists. Registration is now open. Please see the "Register Online" hyperlink in the column to the right. Limited funding will be provided on a first-come, first-serve basis to student and postdoctoral participants based outside of the Greater Toronto Area. The deadline for funding applications is Monday, November 20, 2017. Please see the "Funding Application" hyperlink in the column to the right.